Following on Easter, Jamie over at Sophia’s Children reminds us of the deep, ancient wisdom held in the archetype of The Black Madonna…read, reflect, enjoy…In Jamie’s words “…this Whole Feminine, this symbol of deep wisdom and Unity, of remembrance and healing of what has been fragmented and abused, … is needed right now in the world. 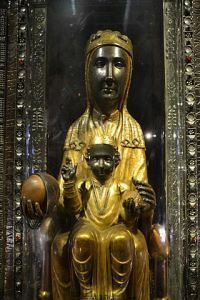 La Moreneta Madonna of Montserrat, a more renowned Black Madonna I visited with at the Santa Maria de Montserrat monastery in the Montserrat mountain in Catalonia. There is also another nearby, in a more humble location amongst the people. Given what I’ve shared in recent (and previous) posts, it seems a fine time to have a nice pot of tea and a renewing, revitalizing visit with the Black Madonna. I’ve written a lot about the Black Madonna over the years, and will link to a couple of those posts here — they delve more deeply into the meaning, the history, and my own journey of introduction to her Mysteries. In short, the Black Madonna is the Virgin and Child, Mother Mary and the Christ child. With a twist. The most interesting detail in the original post was, for me, the note that Lech Walesa wore a Black Madonna pin on his lapel and dedicated his Nobel Prize to her. It caught my attention because I’ve been pondering a re-write of a post about solidarity: real solidarity, not the glib and facile hashtag solidarity of these times. I really regret that I missed the Dark Madonna at Salisbury. But, that’s travel. There’s always something missed – it’s the way life is! This was an interesting post — very much appreciated. Hi, Linda, thanks for dropping by and commenting on Jamie’s post. I find her work chimes very much with my own preoccupations and am pleased to have found Sophia’s Children recently. This post has alerted me to Salisbury UK’s Black Madonna. Very timeous, since I will be paying my first visit there in the last week of this April, and will certainly look her up!